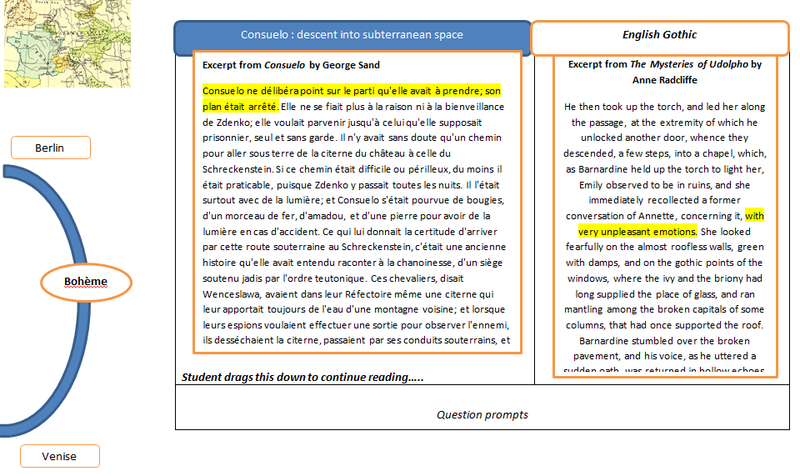 I am a 3rd year PhD student in Modern Languages, and my thesis investigates the uses French writer George Sand makes of the English Gothic Novel in her novels. ‘Intertextuality’ of this comparative kind lends itself to electronic visualisation. 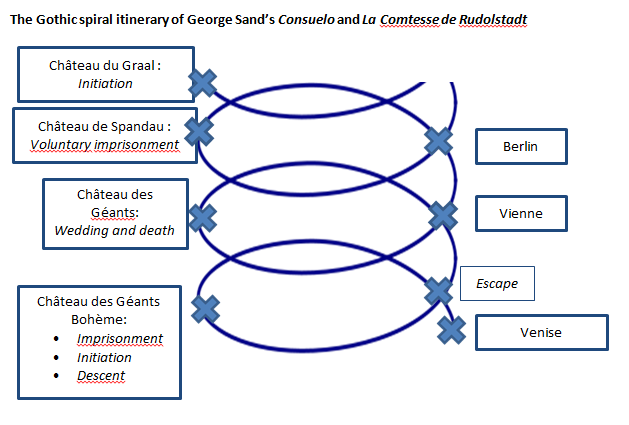 A section of the results of my analysis – the parallel geographical and psychological itinerary of Sand’s eponymous heroine Consuelo – will thus be visualised to develop an interactive tool. A paper I have given on this material has already scoped the compelling motif of the spiral to describe it. The spiral is central to my visualization model. 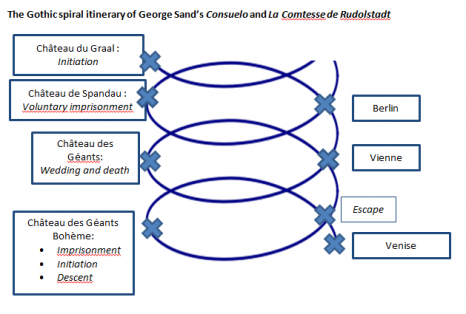 The potential student user would be able to explore the key sequences on this spiral in Sand’s novel, and explore links to English Gothic intertexts. Apart from allowing for a self-directed literature-learning environment, it would provide critical engagement with nineteenth-century texts. It would also enable complex cognitive processes such as noticing patterns and links, and making cross-references. Prof. Mary Orr’s web-based project on Flaubert’s La Tentation de Saint Antoine, will serve as an analogous model in its pedagogical concern of visualising nineteenth-century texts. 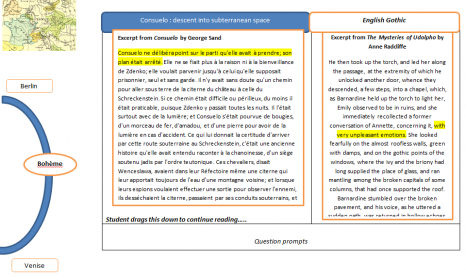 Rather than representing simple one to one links, this tool will access generic and textual underpinnings of Sand’s novel in terms of the Gothic genre but also the French Romantic novel, showing how Sand negotiates a whole tradition. This project will be aimed towards 19th century scholars, ostensibly those on French literature but also to those with comparative literary interests, as well as students seeking to deepen their knowledge of these novels. Figure 2: A projection of the comparative literary tracks which would be visualised.